It was a very cold morning. I sat in the warmth of my home, in my favorite chair, reading my Bible. I paused when I read these words, “Be joyful in hope.” (Romans 12:12a). In that moment, I had to stop and ask myself, was I being joyful and hopeful in my waiting circumstance? To better answer that question, I set out on a journey to discover what the word hope meant in this passage. The dictionary defined hope as a desire for something, but there is an uncertainty as to whether or not it will happen. (Example – I hope the weather will clear). This kind of hope doesn’t necessarily bring a sense of joy. I continued along my journey and looked up the biblical meaning for hope and found it means this – a confident expectation for something good in the future. Just thinking about these words individually – confidence – expect – good – brought a sense of joy to my soul! Wanting to get to the heart of applying this in my own life, I continued with my journey and asked myself another question – How can someone hope joyfully while they are waiting? I went back to my Bible and started to look up verses with the word “hope” in them and came across this one – “Guide me in your truth and teach me, for you are my God my Savior, and my hope is in YOU all day long.” (Psalm 25:5). At the top of my journal page that morning, I wrote out Romans 12:12a and Psalm 25:5. Then I wrote these words…Our hope in our waiting times comes when we remember God…when we remember that He is faithful…when we remember that He is Sovereign and in control…when we place our trust in Him! Here, in this surrender of laying down our stubborn thoughts and thinking of HIM, we find our hope and can watch with expectation for His plan to unfold. As I think these right thoughts, my heart knows confidence…my eyes begin to look with expectation…there is the peace that calms me as I think about the good that will come in God’s perfect timing! When you find yourself in a “waiting room”, and you don’t see the answer on the horizon, speak truth to your heart. Remind yourself (often!) that God is in control. Praise Him for this! Remember all the ways He has been faithful to you in the past! 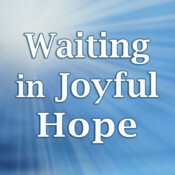 As you lay down your will for His will, your heart will be strengthened to HOPE in Him and find JOY in the wait! Wishing you joy and hope in your wait…and a Grace Full Week! “Laying down my will for His.” It’s a moment by moment discipline. But well worth the peace…and hope it brings. Thank you, Kath, for the challenge! Thank you Kathy for this reminder! I feel as though, if we don’t put our hope in the Lord, we will quickly die inside. And as Dee said, it IS a challenge, a moment by moment discipline. Thank you.